The 1966 Renault 10 Major shared its 2066-millimetre ( 89-inch) wheelbase with the Renault 8 but the 10 was 30 centimetres longer overall. Much of the new sheet metal went in front to create a more commodious trunk. French automaker Renault had enjoyed success in Canada with its tiny Dauphine. Other products followed and for those consumers who enjoyed marching to the beat of a different drum, the Renault offerings were often right up their alley. People in Quebec and British Columbia were most fond of the little cars from France. Like its smaller brother, the 10 made use of the Sierra 1100 cc (68 cubic inch) 50-horsepower mill. With the engine mounted in the rear, like the Renault 8, the car was capable of speeds as fast as 136 kilometres (85 miles) per hour. Even if one drove at that speed all day, fuel consumption was a miserly 7.2 litres per 100/km (45 miles to the Imperial gallon) and the gas tank held 8.5 (38.6 litres) of them. A four-speed synchromesh stick shift was mated to the engine and delivered a smooth, silky getaway. An interesting feature was a sealed cooling system, which meant there was no need to add anti-freeze in winter. 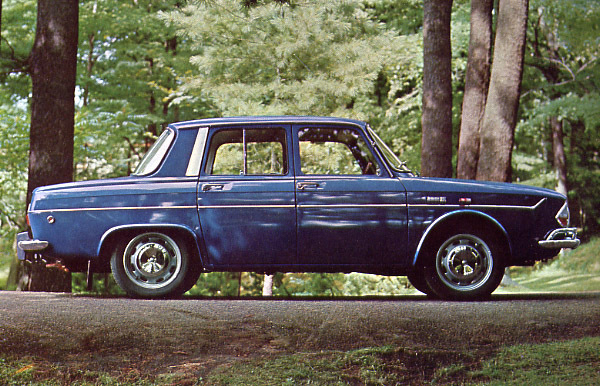 The rear-engined 1966 Renault 10 Major weighed in at 793 kilos (1,750 pounds). Instrument panel for the 1966 Renault 10 Major was austere even when dressed up in faux burled walnut accents. Styling was square and for a European automobile, featured fairly conservative looks. Because the luggage compartment was in front, the package was designed with a “controlled crush” front end. Though a foot longer than the Renault 8, the 10 had a tidy turning circle of 9.2 metres) 30 foot 4 inches. The larger dimensions were put to good use in giving 311 cubic litres (11 cubic feet) of trunk space. The cabin was capacious for such a compact car. High seats appeared a little odd to the look but that was completely forgotten once seated in exquisite comfort of reclining bucket seats. Tall people loved them, they did not need to hump over or slouch at all. 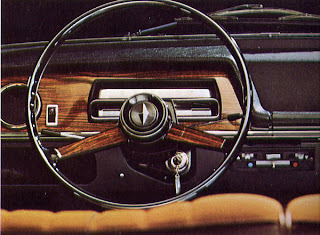 The instrument panel was finished with faux burled walnut inserts and that classy touch extended to the steering wheel and the gear shift knob. Two glove boxes were most useful. The boys at Canada Track and Traffic did not like the instrumentation markings and took decidedly strong exception to the slanted needle used in the speedometer. “While this may not seem to be of a serious nature, it definitely becomes annoying in a car which has so many other good qualities,” they wrote. Standard equipment included a two-speed electric wiper, a heater and demister, a twin-jet windshield washer, emergency flashers, seat belts all around, backup lights, massive rubber bumper overriders, exterior rearview mirrors, a clever tool-roll and oh-so-useful mud flaps. In stoic Gaullic fashion, the options list was short but sweet. It included an optional pushbutton three-speed automatic transmission. A leather/cloth upholstery scheme over firm contoured foam rubber seats that were “better than most cars at any price,” was available as was an AM/FM push-button radio, a cigar lighter, a roof rack, a ski carrier, spot lights, fog lamps, whitewall tires, wheel rims, a tow bar, twin muffler, a tachometer, oil pressure gauge, a steering wheel “glove” and headrests. The 10 Major was not only the biggest sedan the company offered, its $2,148 price tag made it the most expensive Renault sedan on the dealer’s showroom floor. The R4 station wagon listed for $$1,595 and the R-4 Super station wagon listed for $1,695. Both were both continued from last year, as was the Renault 8 with its $1,998 price tag. The stylish Caravelle was continued at $2,995. Gone this year were the familiar and friendly face of the super inexpensive Dauphine and that of the fast Gordini. All prices were F.O.B. Winnipeg. 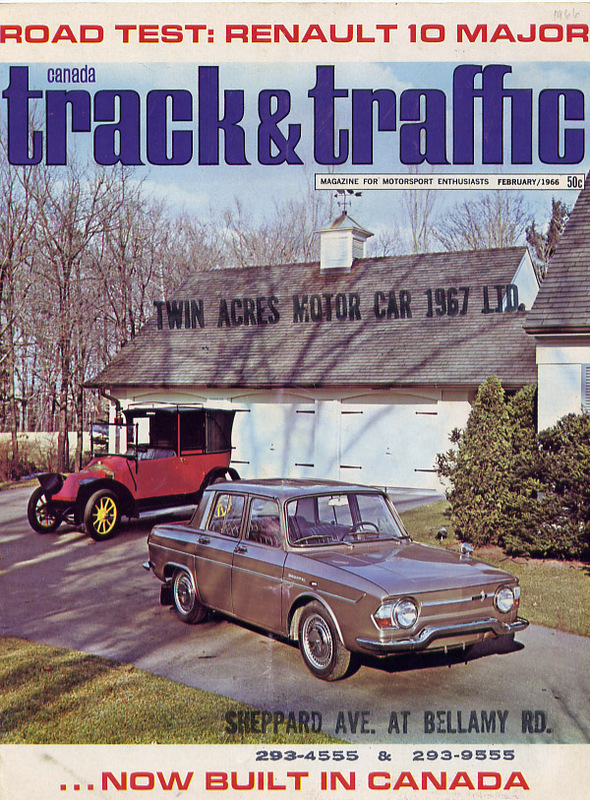 Canada Track and Traffic took a Renault 10 Major out for some serious testing. The editors wrote that this was “one car which may be accused of changing a driver’s personality.” They called it “quite a little rear-engined machine” and speculated openly that folks who got behind the wheel would engage in “exuberant driving.” The Renault 10 Major took top honours at the Shell 400 Rally. If that wasn’t honour enough, the editors of Canada Track and Traffic ultimately named the Renault 10 Car of the Year. Records show that 10 leftover 1965 Renault Dauphine and Gordini models were cleared out in calendar year 1966. The Caravelle found 133 owners. The Renault 4 accounted for 245 deliveries. The sales list shows that 880 Renault 8 sedans were purchased as well as two (!) Gordini versions. The new 10 Major turned out to be the big seller with 1,564 units delivered with manual transmission and another 1,145 equipped with automatic transmission. 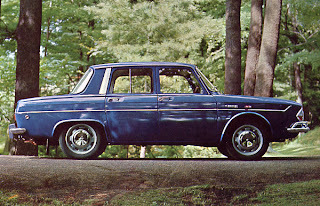 Sales for the year added up to 3,986 units and that was before the 1967 Renault 16 was introduced in the fall of 1966. Sales of that model added another 584 units, giving the Automobiles Renault Canada Limited a total of 4,570 sales for the calendar year. is that the same car of Mr Bean?? Those were the days and those were the cars. I bought a 1100 in '69 and then a 1300 in '71. Now more than 40 years later,(2011) I've bought a 1970, 1300cc R10 in very good condition, and feel "born again". Brings back the memories. I had a 1966 model with the stick shift. It was by far the most fun to drive of anything I ever owned. 45 mpg was impressive and you could fill it up for about $2 USD.